Price: £6.85 (incl VAT) Sorry, this item is currently unavailable. Click here to receive notification when this product comes back into stock. 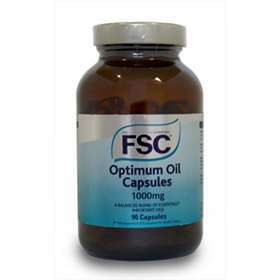 FSC Optimum Oil 1000mg Capsules 90 An ultimate nutritional blend of essential fatty acids, Omega 3/6/9, with organically certified flaxseed, sunflower, evening primrose, olive and sesame seed oils. Essential fatty acids are unable to be made in the body and are consumed by diet through food and supplements. A supreme blend of oils Part of a 'well being and active' program and an essential for supplementing the daily diet. Reduce cholesterol, blood triglyceride's and blood pressure. Decrease inflammation, stiffness and joint dis-comfort. Suitable for all vegans, vegetarians and meat-eaters. Enriched with Omega 3, 6 and 9 nutritional oils. Adults and children over 12 years of age; Take three capsules daily with food. Replace cap firmly after use and store in a cool dry place. Protect from light and heat. Organic Flaxseed Oil, Organic Sunflower Oil, Organic Olive Oil, Organic Evening Primrose Oil, Soya Lecithin(Non GMO), Rice Bran Oil. Capsule Shell; Gelatin. Product code: FSC-152332 Price: £6.85 (incl VAT) Sorry, this item is currently unavailable. Click here to receive notification when this product comes back into stock.